For instance, the choice between having a beer that's aged in some lifeless factory, and one that's aged at sea, having braved monsoons, killer whales and the occasional mermaid attack. Introducing BrewDog Atlantic IPA, the first sea-aged beer to hit the market in nearly 200 years, available next week at select liquor stores and bierkraft.com. Imagine, if you will, a seafaring adventure that looks like The Life Aquatic with Steve Zissou, and you're close to how this ale was created. 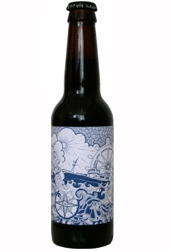 It was aged in the North Atlantic by BrewDog's Scottish founder, who spent two months aboard his trawler, wrestling with waves and whales, even rescuing one of the eight barrels when it went overboard. The recipe was found in a brewer's guide from 1856—so basically, the entire death-defying mission was inspired by how it was done back in the golden age of wayward vessels and pirates (the non-Disney kind). Only 960 bottles survived the journey (and then made it to the U.S.), but they're worth tracking down for their unusual taste—think hints of sorbet and tobacco, vanilla and even oranges. In other words: tastes like breakfast.